The recent massacre at the St. Philip’s Catholic Church, Ozubulu, Anambra State, linked to a gang war among the Nigerian Methamphetamine barons, which resulted in the death of 13 people has brought to the fore the increasing prominent role of Nigerians in the global illicit drug trade. According to sources at the Malaysian embassy in Nigeria, out of 81 Nigerians on death row in their country, 80 of them were sentenced to death for drug-related offences. “As at today, 123 Nigerian students are in various detention centers after being arrested by Royal Malaysian Police for drug trafficking. This is out of a total of 350 foreign students in detention in Malaysia,” said the embassy sources. Another source at the Thai embassy said that another batch of 350 Nigerians were in prison in Thailand for trafficking mainly cocaine and heroin. It was gathered that the Methamphetamine barons were being assisted by Mexicans and Colombians in clandestine laboratories scattered all over the South-east. Checks revealed that the headquarters of the drug agency located in Lagos on Shaw Road, Ikoyi was cut off public electricity supply for almost a year, and was just restored a few weeks back. The Lagos office could not even install the generator donated to them by international partners. The generator is still lying idle in agency’s premises,” a source revealed. A recent report by the International Narcotic Control Board (INCB) which covered a period of three years. 2012 to 2014, had confirmed that the finest quality of Methamphetamine is produced in Nigeria and exported to mainly Japan. This report was analysed by NDLEA/NAFADC Inter-agency Strategic Intelligence team which estimated that this illicit business has fetched drug barons in Nigeria about $939 million in the last three years. 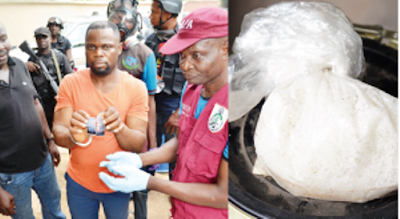 The recent massacre in Ozubulu was linked to a gang war among the Nigerian Methamphetamine barons over sharing of proceeds of the illicit trade. The INCB, saddled with the responsibility of regulating the country needs of narcotic drugs and precursor chemicals for licit uses, stated further that Nigeria’s main sources of importation of ephedrine were India and to a lesser extent Germany. An analysis of the importation figures of ephedrine into Nigeria in the three years under review by INCB showed a disparity of about 8 tons of ephedrine between what India records as having been exported to Nigeria and what the National Agency for Drugs Administration and Control, (NAFDAC) claims was imported from India. It stated that diversion of ephedrine in Nigeria took place through “mis-declaration (false) or non-declaration or obtaining permits in excess of licit needs – stockpiling and/or deferring production. Wikipedia reveals: “Cocaine and meth are a lot alike, while being completely different. The high is similar, cocaine is much stronger initially, but it doesn’t last. People on cocaine need to use more cocaine constantly. Meth will take you almost to the same level as cocaine, but not quite there. But then meth holds you at that point for sixteen hours without needing more. “Cocaine is a numbing agent; it will cause you to not be able to feel tactile sensations. A person who is really high on cocaine can handle pain well because he is numb to it in some ways. A person on meth will feel all the sensations as though he wasn’t on meth, but the meth user won’t care about things like that if he doesn’t want to. Meth makes you ignore your pain but aware of it if you cared.